Diamonds ore are extremely rare, with concentrations of at most parts per billion in source rock. 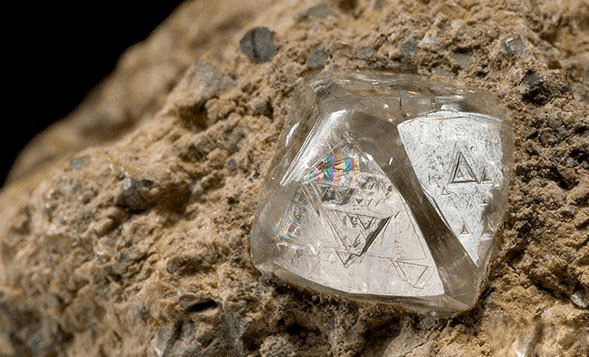 most diamonds were found in alluvial deposits. Loose diamonds are also found along existing and ancient shorelines, where they tend to accumulate because of their size and density. Rarely, they have been found in glacial till (notably in Wisconsin and Indiana), but these deposits are not of commercial quality. These types of deposit were derived from localized igneous intrusions through weathering and transport by wind or water. Most diamonds come from the Earth’s mantle, and most of this section discusses those diamonds. However, there are other sources. Some blocks of the crust, or terranes, have been buried deep enough as the crust thickened so they experienced ultra-high-pressure metamorphism. 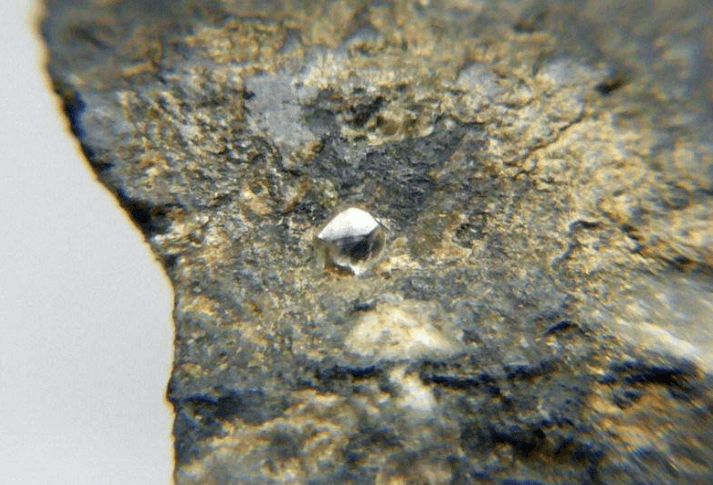 These have evenly distributed microdiamonds that show no sign of transport by magma. Jubilee, also known as the Yubileyny diamond mine, located in Sakha (Yakutia), Republic of Russia, is the biggest diamond mine in the world. The Udachny diamond mine, also located in the Yakutia region of Russia, ranks as the world’s second largest diamond mine by reserve size. Mir or Mirny, another diamond mine in the Yakutia region of Russia, is the third biggest diamond mine in the world. Argyle diamond mine located in the Kimberley region of Western Australia ranks as the world’s biggest diamond mine if JORC reserves alone are taken into account. 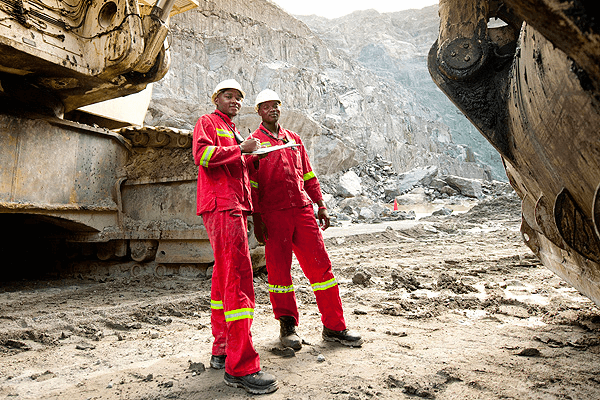 Catoca diamond mine in Angola ranks as the fifth biggest diamond mine in the world. Venetia diamond mine located 80km from Musina in Limpopo Province of South Africa ranks as the world’s sixth largest diamond mine. Grib diamond mine, which is yet to commence commercial production, is Russia’s fourth largest and world’s seventh largest diamond mine. 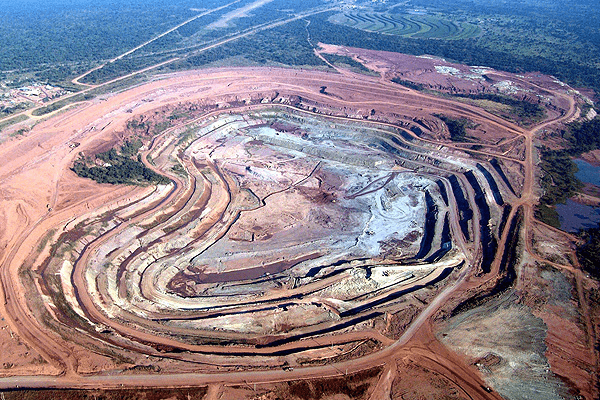 Jwaneng diamond mine in African country Botswana ranks as the eighth biggest diamond mine in the world. 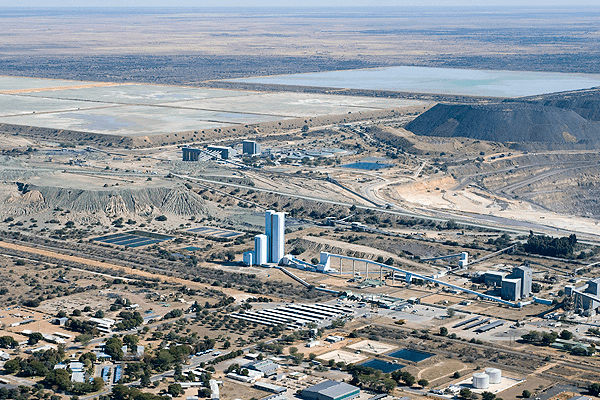 Orapa diamond mine located 240km west of Francistown city in Central Botswana is the ninth largest diamond mine in the world by reserve. 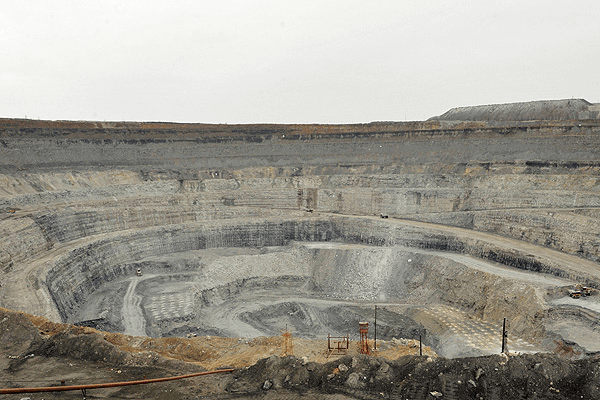 Botuobinskaya diamond mine, due to commence production in 2015, is located in the Nakyn kimberlite field, around 200km north-west of Nyurba in the Yakutia region of Russia. Other countries that produce diamonds include Congo (gold), Brazil, Guyana, Venezuela, Central Africa, Garner, Guinea, Ivory Coast, Liberia, Namibia, Sierra Leone, Tanzania, Zimbabwe, Indonesia, India, China, Canada and so on. 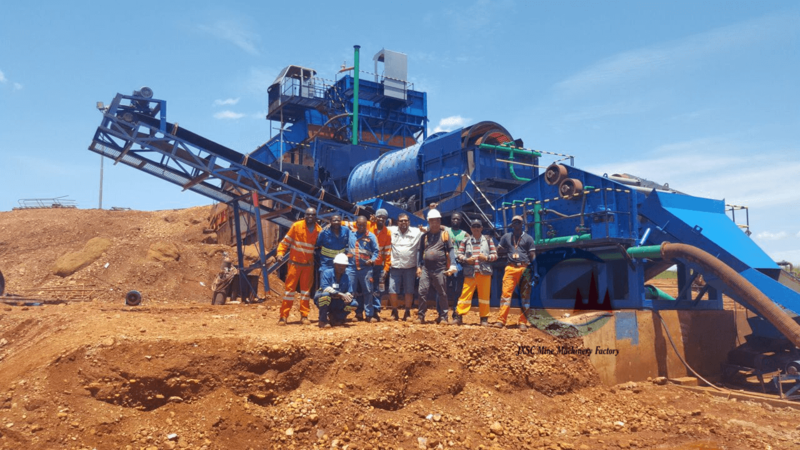 How to wash and separate out diamond with diamond ore mining equipment? The diamond raw material is mostly existing as alluvial type, sand, stone, gravel, sticky clay,ect. Need to use various kinds diamond ore mining equipment to extra out diamond. So firstly, will need to washing clean the material with diamond washing trommel scrubber, wash clean the sticky clay, remove some big stone by grizzly bar when feeding material, and sieving out needed size particles by high frequency vibration screen , this is according to the diamond ore sizes, for example, there has diamond size range 2-15mm, then screen mesh size can make 2 mm and 15 mm . after sieving out needed sizes, can use the heavy media concentrator to concentrate diamond ore, such as diamond jig separator, shakign table,ect. or use X-ray machine to select out diamond. Those are all useful diamond ore mining equipment. 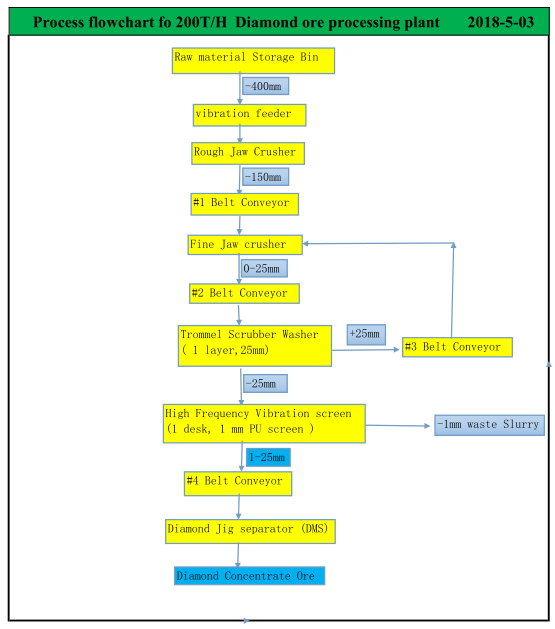 JXSC mine machinery Company in China has more than 30 years professional experience at diamond ore mining euqipment, can design full set diamond washing plant flowchart , provide complete set diamond mining equipment, send engineer to diamond mine site for diamond mining equipment installation and commissioning guidance. Have already built many diamond washing plant in Angola, South Africa, Russia, Brazil, Boz wana, ect. 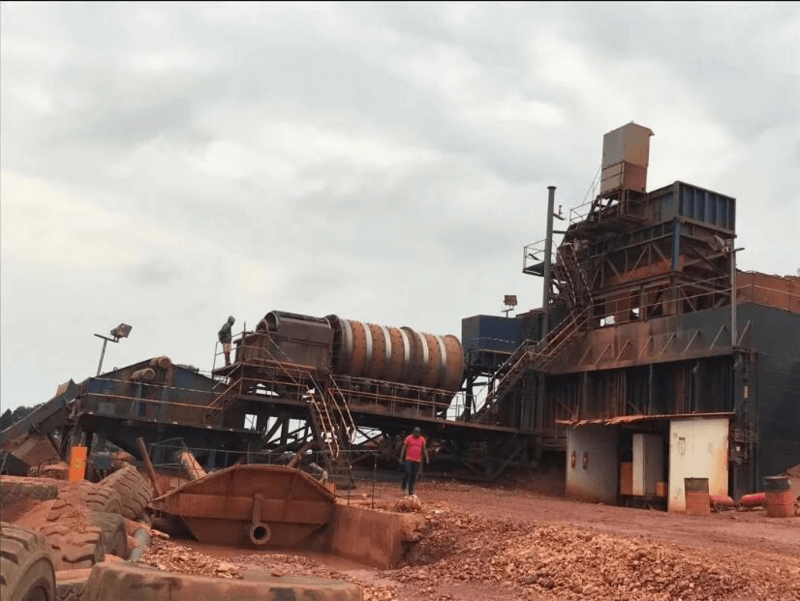 How to extract diamond by diamond ore mining equipment? Diamond ore feeding macine can be vibration feeder, feeding hopper, electrimagnetic vibration feeder, belt feeder, wheel loader or excavator feed directly. 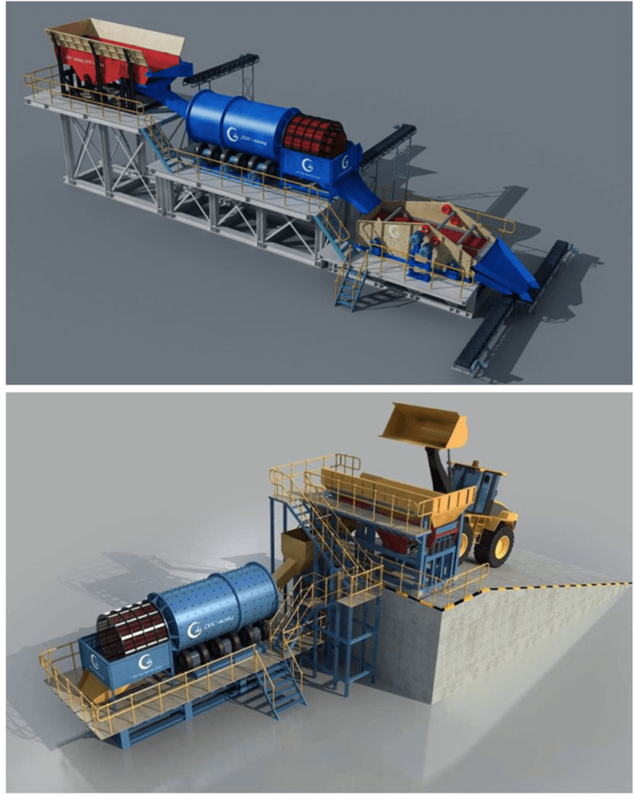 Depends on process capacity and raw material conditions to choose which feeding machine for diamond ore mining. The vibration feeder can made with grizzly bar to remove some big stone when feeding. The diamond washing machine is for washing clean the clay and mud in diamond raw material, most popular diamond ore washing machine are diamond washing trommel scrubber. The diamond drum scrubber washer has especially good washing effect for diamond ore, can wash very clean the sticky clay. after washing clean the caly with diamond washing trommel scrubber, then need to remove some big waste stones ,the under screen materail will go to next machine. This diamond ore mining equipment can use normal trommel screen or diamond ore high frequency vibration screen. Over screen parctiles will be transfered away by belt conveyor. After primary sieving, need 2nd stage sieving again to screen out needed size particles, usually use high frequency vibration screen, screen size according to diamond concentrate size.Over screen parctiles will be transfered away by belt conveyor, under screen partciles will go to heavy medium concentrator machine to select diamond. The diamond mining equipment heavy medium concentrator can be diamond jig separator, shaking table, depends on the diamond concentrate size. The concentrator ore discharged from heavy medium concentrator machine, can use X-ray machine to select diamond concentrate.